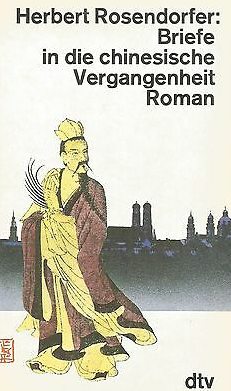 Letters Back to Ancient China / Briefe in die chinesische Vergangenheit is a German book about the adventures of the time-travelling medieval Chinese mandarin Kao-tai. Having arrived not only 1000 years to the future, but also at the wrong place (Munich, Bavaria) he struggles a lot to understand our world. (For kids: Well, without wide-spread internet, cell phones and such.) The novel is written as an epistolary novel; we only see Kao-tai's letters. Early in the story, Kao-tai renders German in Chinese syllables - Mark becomes Ma'l'ch. Later, he translates the words to a poetic style - like when he wonders why a famous author is only called "the man" ("Mann" in German). Bilingual Bonus: There are many bilingual puns. One example: The German unions are mentioned, which are all named "IG ...". This abbreviation is pronounced like Mandarin for "give once", but Kao-tai writes that they rather should be named "take ten thousand times". Cute Kitten: Kao-tai likes his Shiao-shiao and misses her. Deliberate Values Dissonance: Kao-tai doesn't understand why he shouldn't have an affair with two women at the same time, as long as he can satisfy them both. Also, when he compliments one of them on her breasts, she is miffed. And he misses cooked dog. And so on. Eat the Dog: Sadly, in Germany you won't get Pekingese's liver and such. The '80s: When it was written and set. Fanservice: The protagonist and another guy who might be the Author Avatar visit a striptease bar which presents several interesting acts, including that one involving a woman swallowing three ping-pong balls and making them, er, reappear. Fish out of Temporal Water: Not just that. Freudian Excuse: Said woman (see above) rationalized his odd behavior by concluding that he wasn't breastfed enough. Green Aesop: The Author Avatar tells a story about a friend of him who had stored away some old furniture which was then eaten by woodworms, which multiplied and became fatter and fatter - until the day when they had eaten everything and all of them died at the same time. No Celebrities Were Harmed: There's one poet whom he calls "Si-gi who only writes during summer ". Also a minister who's only mentioned as "demonic southern barbarian". Political Correctness Gone Mad: The guy who's probably the Author Avatar decries p.c. terms like "disabled" instead of "crippled" or "lame" and calls this "lying language". Required Secondary Powers: The story is about a Chinese mandarin who travels 100 years into the future, but ends up in Munich, Bavaria because the Earth rotates below him. Why he still ended up on Earth instead of somewhere else isn't covered. The Sequel: Came out in 1999 and features a lot about the German reunification. After reading Buddenbrooks, Kao-tai wants to read more books by Thomas Mann. However, his description of Magic Mountain is that nothing happens except everyone's sick on the lungs. Toilet Humor: Since Kao-tai doesn't know how modern German toilets work and didn't want to ask. But it's still done in as good taste as possible.